Gyeonggi-do (Hangul: 경기도, [kjʌŋ.ɡi.do]) is the most populous province in South Korea. Its name, Gyeonggi means "the area surrounding capital". Thus Gyeonggi-do can be translated as "province surrounding Seoul". The provincial capital is Suwon. Seoul—South Korea's largest city and national capital—is in the heart of the province but has been separately administered as a provincial-level special city since 1946. Incheon—South Korea's third largest city—is on the coast of the province and has been similarly administered as a provincial-level metropolitan city since 1981. The three jurisdictions are collectively referred to as Sudogwon and cover 11,730 km2, with a combined population of 25.5 million—amounting to over half of the entire population of South Korea. Gyeonggi-do has been a politically important area since 18 BCE, when Korea was divided into three nations during the Three Kingdoms period. Ever since King Onjo, the founder of Baekje (one of the three kingdoms), founded the government in Wiryeseong of Hanam, the Han River Valley was absorbed into Goguryeo in the mid-fifth century, and became Silla's territory in the year 553 (the 14th year of King Jinheung). Afterward, the current location of Gyeonggi-do, one of the nine states of Later Silla, was called Hansanju. The Gyeonggi region started to rise as the central region of Goryeo as King Taejo of Goryeo (the kingdom following Silla) set up the capital in Gaesong. Since 1018 (the 9th year of Goryeo’s King Hyeonjong), this area has been officially called "Gyeonggi." During the Joseon, which was founded after the Goryeo, King Taejo of Joseon set the capital in Hanyang, while restructuring Gyeonggi's area to include Gwangju, Suwon, Yeoju, and Anseong, along with the southeast region. Since the period of King Taejong and Sejong the Great, the Gyeonggi region has been very similar to the current administrative area of Gyeonggi-do. 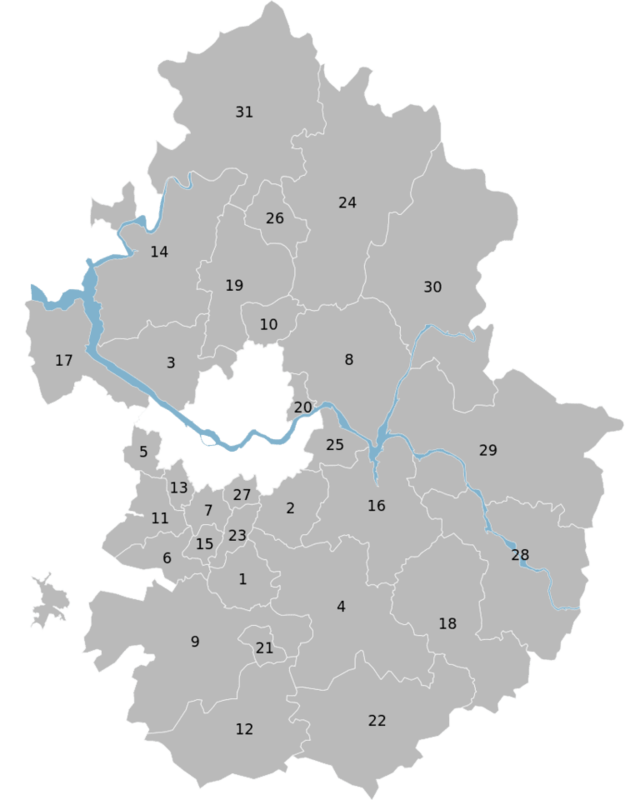 In 1895 the 23-Bu system, which reorganized administrative areas, was effected. The Gyeonggi region was divided into Hanseong (modern Seoul; Hanseong-bu; 한성부; 漢城府), Incheon (Incheon-bu; 인천부; 仁川府), Chungju (Chungju-bu; 충주부; 忠州府), Gongju (Gongju-bu; 공주부; 公州府), and Kaesong (Kaesong-bu; 개성부; 開城府). During the Japanese colonial period Hanseong-bu was incorporated into Gyeonggi-do. On October 1, 1910, it was renamed Keijo and a provincial government was placed in Keijo according to the reorganization of administrative districts. After liberation and the foundation of two Korean governments, Gyeonggi-do and its capital, Seoul, were separated with partial regions of Gyeonggi-do being incorporated into Seoul thereafter. Additionally, Kaesong became North Korean territory, the only city to change control after the countries were divided at the 38th parallel, which is now part of North Korea's North Hwanghae Province. In 1967 the seat of the Gyeonggi provincial government was transferred from Seoul to Suwon. After Incheon separated from Gyeonggi-do in 1981, Gyeonggi regions such as Ongjin County and Ganghwa County were incorporated into Incheon in 1995. Gyeonggi-do is the western central region of the Korean Peninsula, which is vertically situated in Northeast Asia and is between east longitude of 126 and 127, and north latitude of 36 and 38. Its dimension is 10% of Korea’s territory, 10,171 square kilometres (3,927 sq mi). It is in contact with 86 kilometres (53 mi) of cease-fire line to the north, 413 kilometres (257 mi) of coastline to the west, Gangwon-do to the east, Chungcheongbuk-do and Chungcheongnam-do to the south, and has Seoul, the capital of the Republic of Korea, in its center. Its provincial government is in Suwon, but some of its government buildings are in Uijeongbu for the administrative conveniences of the northern region. The climate of Gyeonggi-do is the continental climate, which has a severe differentiation of temperature between summer and winter, and has distinctions of four seasons. Spring is warm, summer is hot and humid, autumn is cool, and winter is cold and snowy. The annual average temperature is between 11–13 °C (52–55 °F), where the temperature in the mountainous areas to the northeast is lower and the coastal areas to the southwest is higher. For January’s average temperature, the Gyeonggi Bay is −4 °C (25 °F), the Namhangang (River) Basin is −4 – −6 °C (25–21 °F), and the Bukhangang (River) and Imjingang Basins are −6 – −8 °C (21–18 °F). It becomes colder and higher in temperature differentiation from coastal to inland areas. Summer has a lower local differentiation compared to winter. The inland areas are hotter than the Gyeonggi Bay area, the hottest area is Pyeongtaek, making the average temperature of August 26.5 °C (79.7 °F). The annual average precipitation is around 1,100 millimetres (43 in), with a lot of rainfall. It is rainy in summer and dry during winter. The northeastern inland areas of Bukhangang and the upper stream of Imjingang has a precipitation of 1,300–1,400 millimetres (51–55 in), whereas the coastal area has only 900 millimetres (35 in) of precipitation. The topography of Gyeonggi-do is divided into southern and northern areas by the Han River, which flows from east to west. The area north to the Han River is mainly mountainous, while the southern area is mainly plain. The configuration of Gyeonggi-do is represented by Dong-go-seo-jeo (high in the east and low in the west), where the Gwangju Mountain Range and the Charyeong Mountain Range spreads from the east and drops in elevation in the west. The fields of Gimpo, Gyeonggi, and Pyeongtaek extend to the west. Gyeonggi-do boasts beautiful nature stocked with rivers, lakes, mountains, and seas. Its representative rivers are the Hangang, Imjingang, and Anseongcheon (Stream), which flow into the Yellow Sea, with Gyeonggi Plain, Yeonbaek Plain and Anseong Plain forming a fertile field area around the rivers. 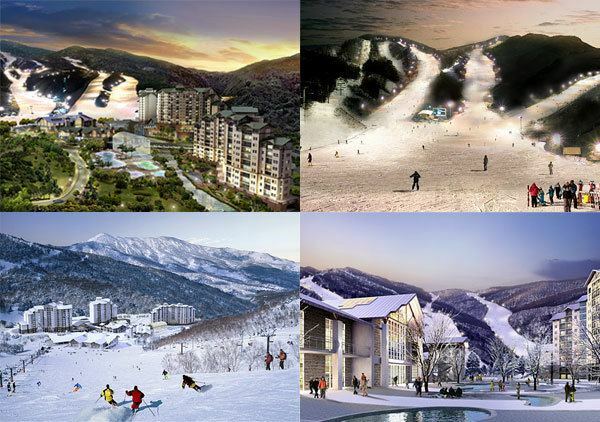 The Gwangju Mountain Range and the Charyeong Mountain Range stretch toward China in Gyeonggi Province. Most of the mountains that rise above 1,000 metres (3,300 ft), such as Myeongjisan (1,267 metres (4,157 ft)), Gukmangbong (1,168 metres (3,832 ft)) and Yongmunsan (1,157 metres (3,796 ft)), are included in the Gwangju Mountain Range. It has a developed granite area which, due to the granite’s exfoliation effect, makes it full of strangely shaped cliffs and deep valleys. 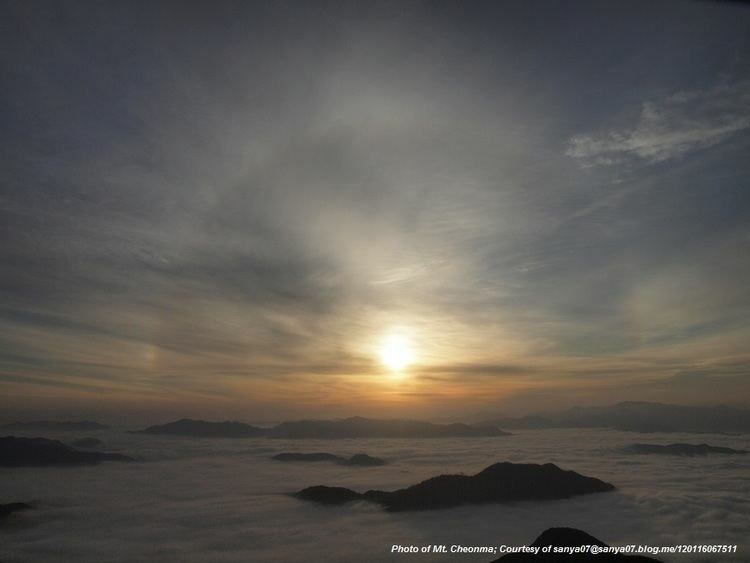 The Charyeong Mountain Range forms the boundary between Gyeonggi-do and Chungcheongbuk-do, but is a relatively low-altitude hilly area. In Gyeonggi-do, there is Bukhansan National Park in Uijeongbu. For provincial parks, there are the Chukryeongsan Natural Recreation Area, Namhan-sanseong Provincial Park, Gapyeong Yeoninsan Provincial Park, and Mulhyanggi Arboretum. 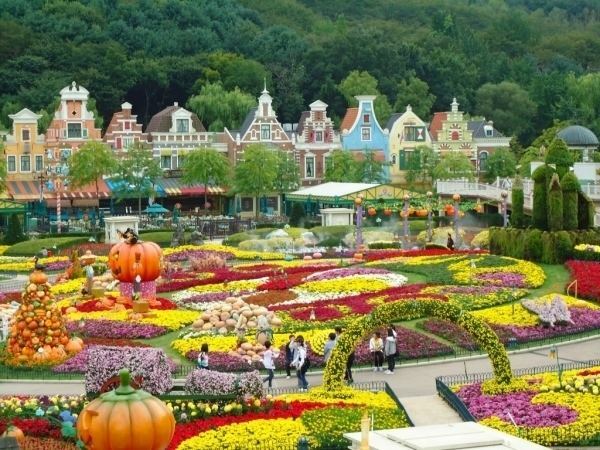 Besides the listed, the scenery of well-known mountains including Soyosan of Dongducheon City, Yongmunsan of Yangpyeong County, and Gwanaksan of Anyang and Gwacheon, along with Hangang and Imjingang are famous tourism sites of Gyeonggi-do. Gyeonggi-do has shown a rapid increase in population due to the modernization and urbanization of the Republic of Korea. Its population has increased from 2,748,765 in 1960 to 3,296,950 in 1970; 4,933,862 in 1980; 6,619,629 in 1992; 8,982,298 in 2000; and 12,071,884 in 2010. In 2010 there were 4,527,282 households, with an average of 3 people per family. There were 6,112,339 males and 5,959,545 females. The population density was 1119 people/km2, almost double the national average of 486 people/km2. Excluding the two metropolitan cities (Seoul and Incheon), the most heavily populated area as of 2010 is Suwon (1,104,681) followed by Seongnam (996,524), Goyang (962,297), Yongin (891,708), Bucheon (890,875) and Ansan (753,862). The lowest populated area in 2010 was Yeoncheon County (45,973) followed by Gapyeong County (59,916) and Gapyeong County (72,595). As the backbone of Seoul in the means of manufacturing complex, Gyeonggi-do is evenly developed in heavy industry (electronics, machine, heavy and chemical industry, steel), light industry (textile), and farm, livestock and fisheries industry. Due to the influence of recent high wages, the weight of manufacturing industries has decreased in Korea’s economy. Gyeonggi-do is making efforts in many ways to improve and modernize the conventional industry structure. Gyeonggi-do is unsparingly investing in the promotion of service industries related to soft competitive power such as state-of-the-art IT industry, designing, conventions and tourism, along with its great leap as a commercial hub in Northeast Asia using the Pyeongtaek Harbor. Besides this, it is famous for its special local products such as Icheon rice and Icheon/Gwangju ceramics. The manufacturing base of global IT corporations that represent Korea, such as Suwon Samsung Semi-conductor, Paju's LG Corporation LCD Complex, and Icheon's SK Hynix are in Gyeonggi-do. Gyeonggi-do consists of 28 cities (special: 7, normal: 21) and three counties. This is because many counties were elevated to city status owing to the influence of Seoul’s new town development plan. Special cities are especially concentrated in the southern area of Gyeonggi-do. Listed below is each entity's name in English, Hangul and Hanja. Gyeonggi-do's proximity to Seoul, Korea's capital, and Incheon, its second busiest port, has contributed to its extremely well-developed transportation infrastructure. It is close to both Incheon International Airport, South Korea's main international gateway and busiest airport, and Gimpo International Airport, its second busiest airport. Use of water transportation from the harbor at Pyeongtaek is also high. Gyeonggi-do is served by Korail commuter, standard and high-speed (KTX) services. It is home to Korea's first railroad, the Gyeongin Line, and includes portions of the Gyeongbu Line, Gyeongui Line, Jungang Line, and Honam Line. Gyeonggi has stations on the Suin, Bundang, Gyeongchun, and Shinbundang commuter rail services and the Gyeongbu and Honam High Speed Railways. The area has numerous connections to the Seoul Metropolitan Subway system. Seoul Subway Line 1 (formerly Korea National Railroad of Seoul) extends to Cheonan past Gyeonggi-do to the southwest, and to Dongducheon to the north. Line 3 connects to Goyang to the north, while Line 4 is connected to Gwacheon and Ansan to the southwest, and Line 7 is connected to Uijeongbu to the north and Gwangmyeong to the south. Line 8 is extended to Seongnam to the south. Uijeongbu has its own light rail system, the U Line, which connects to Line 1. A portion of the AREX line between the Gimpo and Incheon airports passes through Gyeonggi, but there are no stops within the province. Gyeonggi-do is actively investing in education to foster a talented population suitable for the globalized economy. It is promoting the opening of local campuses of reputable universities as well as establishing special purpose high schools for high-quality education. It has also founded and operates at Paju the largest domestic "English village" for education in the English language, as well as villages in Ansan and Yangpyeong. Gyeonggi-do has long been a capital area, leaving many historic relics and ruins. For royal tombs (called reung), there are Donggureung of Guri, and Gwangreung, Hongreung and Yureung of Namyangju. For castles (called seong), there are Suwon Hwaseong, which is designated as the World Cultural Heritage, Namwonsanseong, Haengjusanseong, and Ganghwasanseong. For Buddhist temples, there are many aged temples within Gyeonggi-do where one can experience ‘temple stay’. You can view folk culture in the Korean Folk Village in Yongin, and the scene of Korea’s division at Panmunjom in Paju. Gyeonggi-do is investing a lot of money at a provincial level so that people do not have to go to Seoul to enjoy a high-class cultural life. There are performances at Gyeonggi Arts Center in Suwon as well as at Gyeonggi Korean Traditional Music Center in Yongin. Gyeonggi Provincial Museum in Yongin, Nam June Paik Art Center in Yongin, Gyeonggi Museum of Art in Ansan, and the Ceramics Museum in Gwangju are some of the facilities that are currently run by the province. 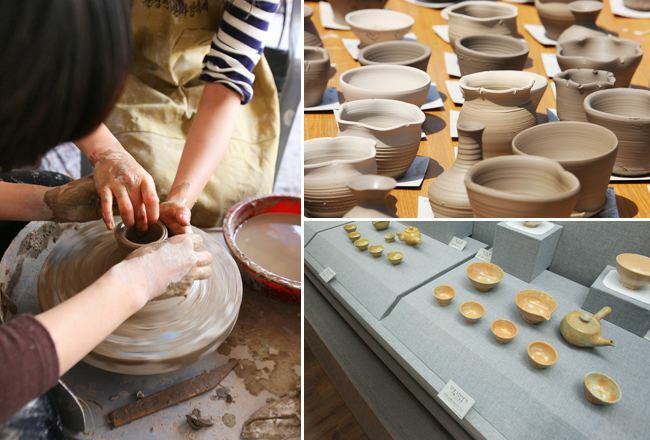 There are also sightseeing opportunities at Jangheung Art Park, Publication Art Complex at Heyri, Paju, and the Icheon Ceramics Exposition. Heyri Art Valley is Korea's largest art town. Various Korean artists constructed the cultural town of Heyri and it features seberal art galleries and museums there are about 40 museums, exhibitions, concert halls and bookstores. According to the census of 2005, of the people of Gyeonggi-do 34.3% follow Christianity (21.9% Protestantism and 12.4% Catholicism) and 16.8% follow Buddhism. 51.1% of the population is mostly not religious or follow Islam or indigenous religions. The 2002 Korea-Japan World Cup matches were held in Suwon World Cup Stadium. As for the professional soccer teams with Gyeonggi-do as their home ground, there are the Suwon Samsung Bluewings and Seongnam FC. Also, there is the professional basketball team of Guri Kdb Life Winnus, sponsored by Kdb Life Insurance. Korea's foremost thoroughbred horse racing track Seoul Race Park is in Gwacheon. Sailing is a high-profile sport in Gyeonggi. Gyeonggi-do's location on the bank of the river Han makes it an ideal venue for the sport which is host to the prestigious Korea Match Cup event which is a part of the World Match Racing Tour. The event draws the world's best sailing teams to Gyeonggi in a gladiatorial battle of nerve and skill on the water. The identical supplied (KM-36) boats are raced two at a time in an on the water dogfight which tests the sailors and skippers to the limits of their physical abilities. Points accrued count towards the World Match Race Tour and a place in the final event, with the overall winner taking the title ISAF World Match Racing Tour Champion. Match racing is an ideal sport for spectators in Gyeonggi. Racing in such close proximity to the river bank provides excellent heart of the action views for the audience. Highlights of the event can be seen on KBS World television and via the official World Match Racing Tour website. Munhwa Broadcasting Corporation (MBC) Dramia at Cheoin-gu in Yongin-si; is the filming location of historical dramas such as Moon Embracing the Sun, Jumong, Queen Seondeok and Dong Yi. Viewing tours are available, which includes traditional folk games, historical court dress and archery. Gyeonggi-do has long been famous for its Icheon rice, Yangpyeong Korean beef, Suwon cow ribs and Korean court cuisine, and marine delicacies made of fresh marine products from the west coast.